I sit down to write my weekly blog. One last look at my social media before I start to write… an alert grabs my attention. ‘Code Red’ issued for a high school in Coral Springs, FL, a school just miles from Marjory Stoneman Douglas High School in Parkland, FL. I google news in Coral Springs, FL searching for more information. I just returned from a book tour in South Florida. I facilitated several workshops for teachers, school administrators, mental health professionals and parents on the topic that children are being traumatized by lockdown drills, active shooter drills, evacuation drills and of course, school shootings. Two survivors, students from the Parkland school shooting took their own lives last week. It seems like the trauma will never end. My mission: Raise awareness that, while our children’s safety is paramount, how do we help them cope and understand that it is NOT NORMAL for them to be traumatized by monthly lockdown drills. – Hiding in closets or under desks while they wait to find out if there is a shooter in their school or it’s just a drill.. I know the protocol. The drill is over and the expectation is that children go immediately back to their desks. Teachers go back to work – probably disciplining kids if they don’t sit down and start working. “Teachers STOP!” – screams the voice in my head. No one – teacher or student can go right back to work. The brain is not capable of immediately returning to previous activity after it was in flight mode. The mind and the body need time to calm down, reset and refocus. The child may pretend they are trying to focus on the teacher’s lecture or figure out an algebra problem, but their brain can’t do it. Instead, they may be thinking what is wrong with me, everyone else can focus – why I am so anxious. 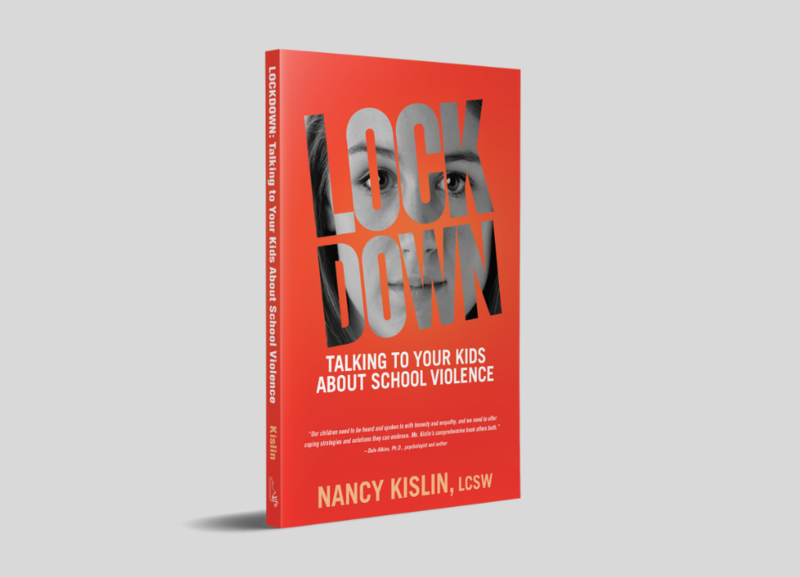 While doing research for my book Lockdown: Talking To Your Kids About School Violence… helping children cope in this climate of fear, I learned that the expectation is that everyone goes right back to what they were doing before the drill occurred. I call this the double assault on children. First we literally scare kids to death, then we act as if it was completely normal to be hiding from a potential killer. By not acknowledging the stress created by school safety drills we are not validating their experience. They don’t know that everyone else is also struggling to focus – they think – what is wrong with me. I instruct school administrators and teachers to implement a TWO MINUTE PAUSE. After the all clear, in some schools the students wait for a knock at the door and a code word and in other schools an announcement is made over the loudspeaker. Once everyone knows it is safe to come out of hiding, the children and the teacher must have two minutes to release and reset. I suggest that for younger students the teacher instructs them to skip around the classroom two times or to do jumping jacks. For older kids, teach them some basic Yoga poses or let them jump up and down. I hope the students at J.P. Taravella school have an opportunity to talk about what happened to them today, to express their feelings with their teachers and their parents. I hope all the students, teachers and parents who were impacted by this event or any lockdown allow themselves to acknowledge that the event may have triggered old feelings and fears. It doesn’t matter how many lockdown drills a child experiences, it is stressful and not normal. Parents and teachers, please talk to the kids. To order book, go to lockdownbook.com. A portion of proceeds of books in Florida go to Make Our Schools Safe.